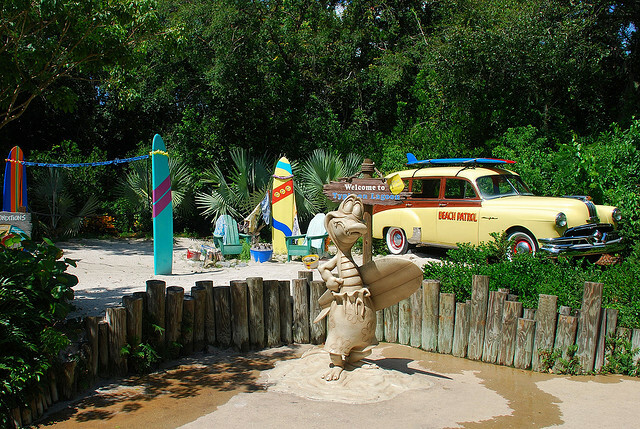 A while back, we polled the WDW Radio Blog readers and asked you to vote on an activity that Lou could try at one of the Walt Disney World theme parks or resorts. Surfing was the clear choice. Always a man of his word, Lou took on the challenge! 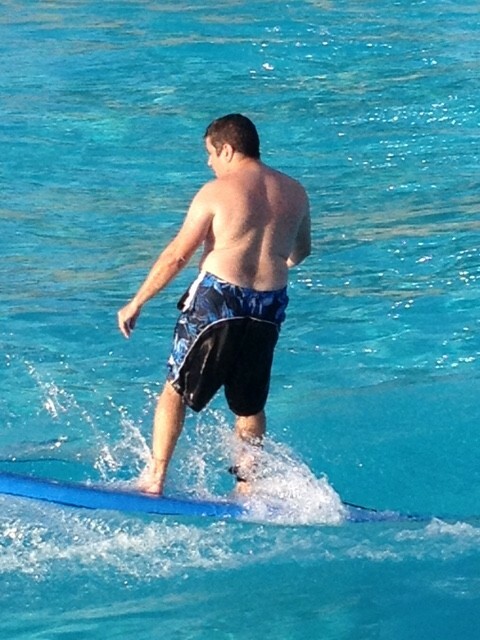 On a very early July morning, Lou arrived for his surf lesson. The time was 5:30 am. 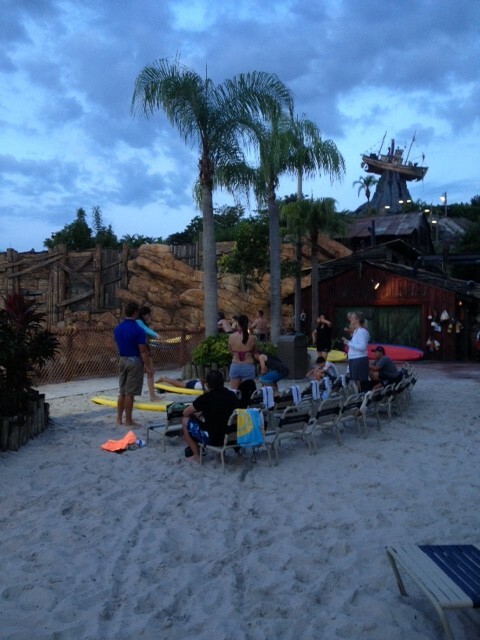 Darkness still blanketed the parking lot as the surf students gathered by the main entrance of Walt Disney World’s Typhoon Lagoon. 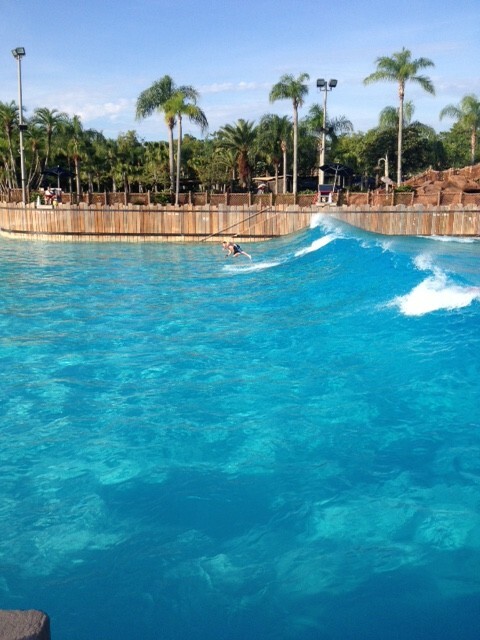 Everyone was checked in and then escorted down to the wave pool. 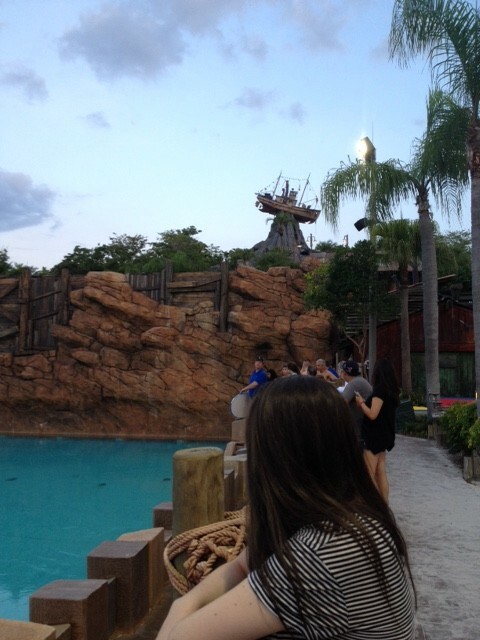 Being at Typhoon Lagoon before it opens is a treat! What an amazing place! 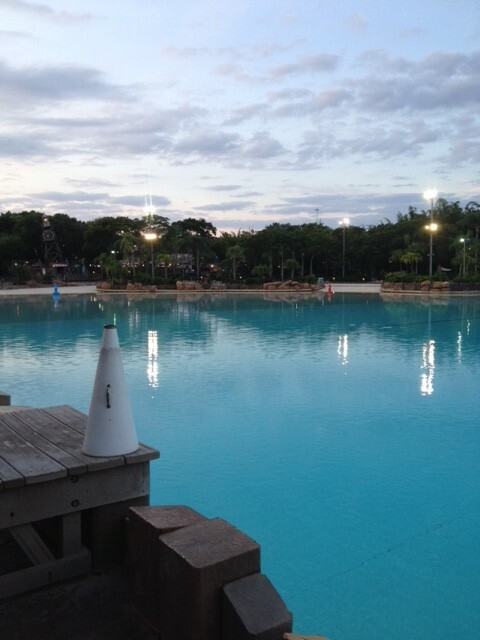 You can really appreciate the landscape and beauty before the crowds take over the park. 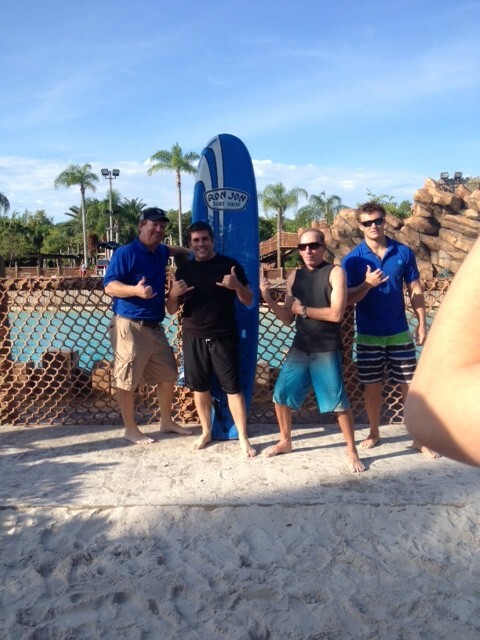 The surf school instructors were eager to meet the new surfers. Friendly and enthusiastic, they welcomed the incoming class of 12. Set up as an outdoor classroom, surf students were seated in rows for the first part of the “land” lesson. 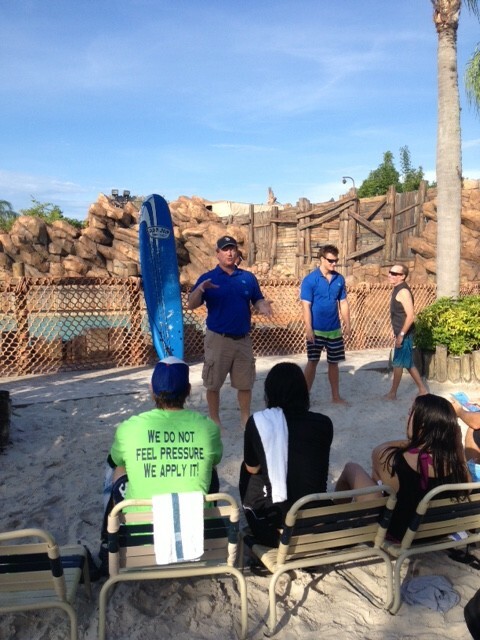 The instructors, who are also professional surfers, went over the basics of technique, form and safety. 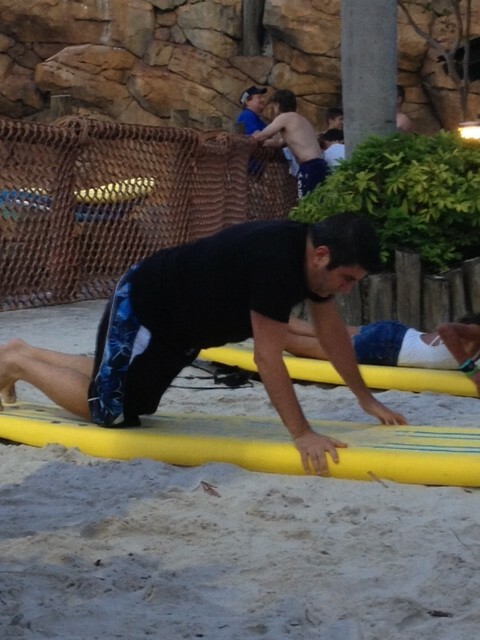 After some demonstrations and pointers, the students were called up to practice on foam boards. 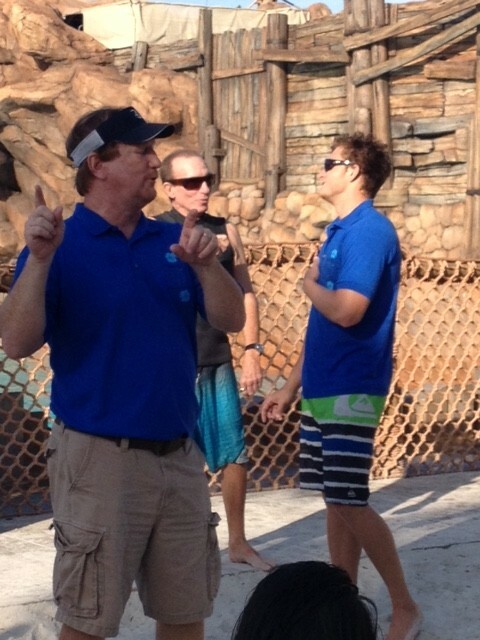 We noticed that the instructors did a great job of guiding the students and giving instant feedback. Keeping the class size small is one way they can individualize the surf experience, while maintaining a safe environment for all. 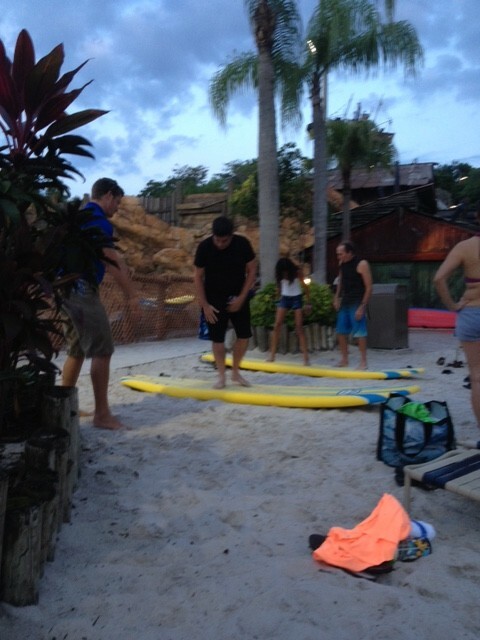 Finding the perfect board is important, so the surfers were encouraged to choose one that felt right. 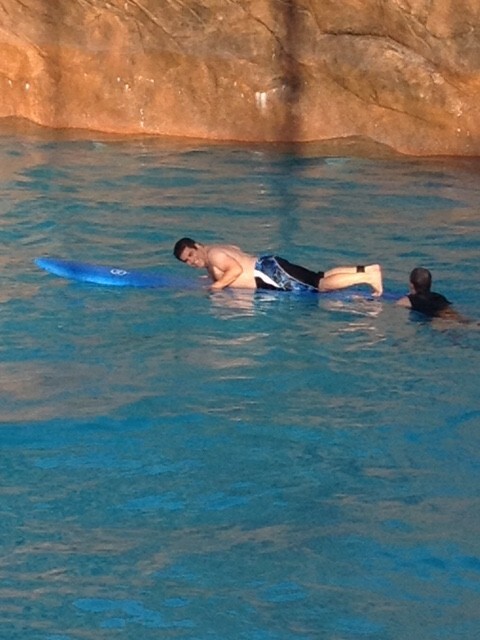 Finally, it was time to hit the waves! Family and friends had to wait on the top deck, but the cheering started with the roar of that first wave. Surfers enter the water two at a time. This is rule is strictly enforced. There must be one teacher to one student for safety purposes. 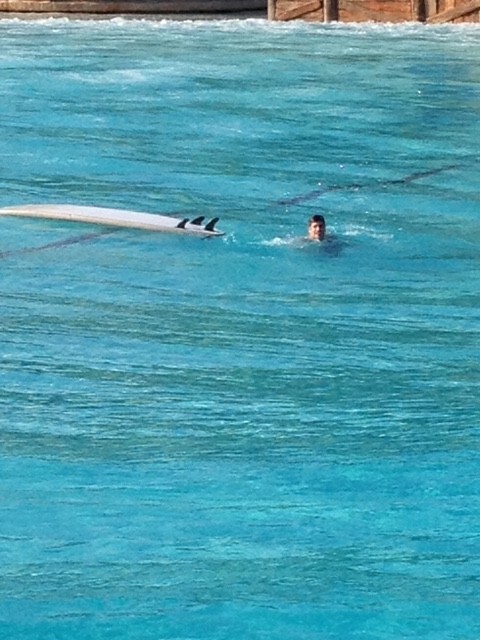 As we watched the surfers take to the water, we were very impressed with the whole operation. 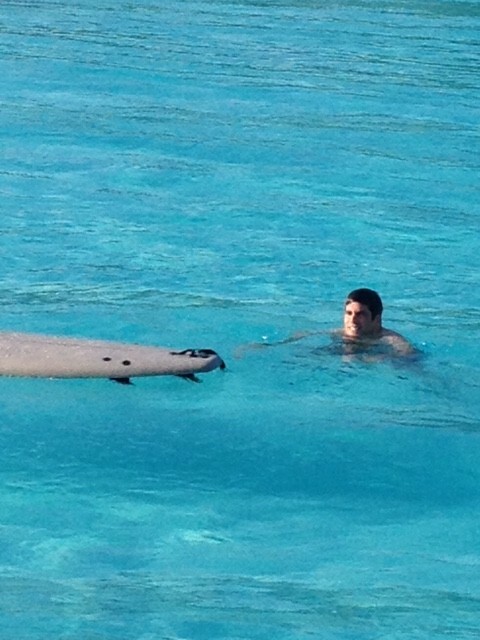 Between the surf school and the life guards, eyes were on the students the entire time. Something else that caught our attention was the constant praise and encouragement being offered. 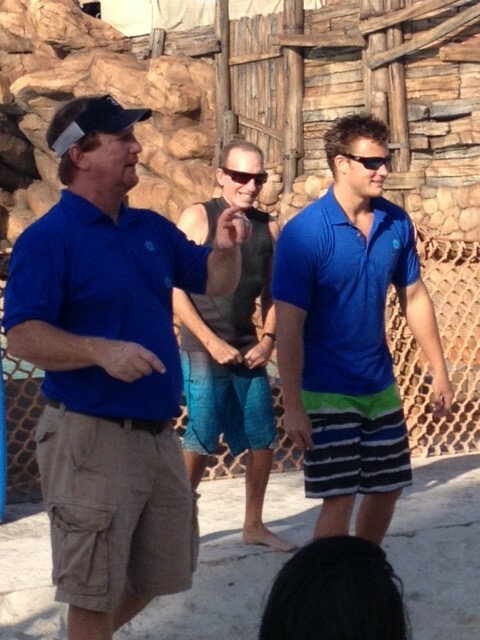 The instructors knew everyone’s name and cheered them on at each wave. Lou did an amazing job! He may have been tired from his early call time, but you couldn’t tell. What a trooper! We cheered him on and saw a huge improvement throughout the morning. 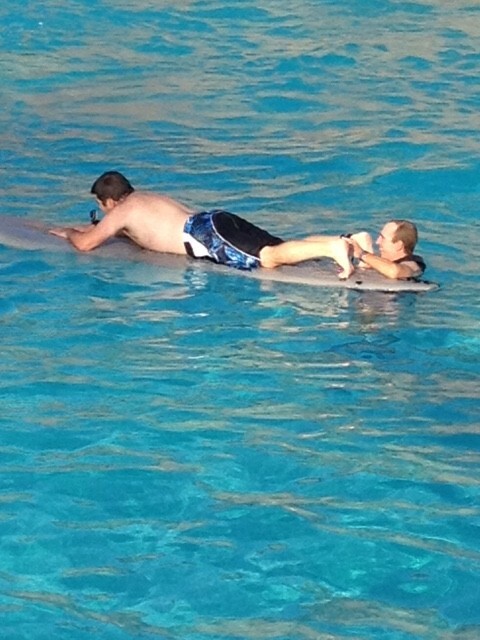 It was really exciting to watch people of all ages get in the water and give this a try! 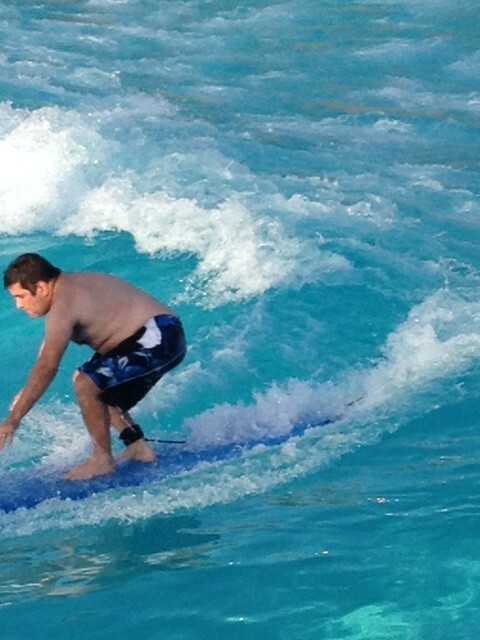 Waves kept coming and each participant had plenty of practice time in the water. Before we knew it, the whistle blew and our time was up. 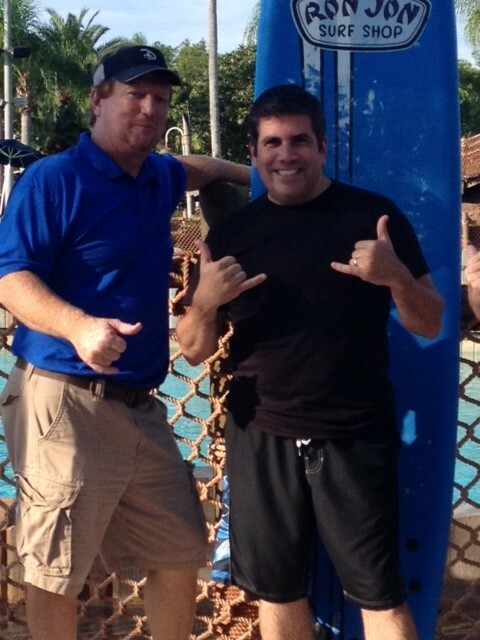 The park was getting ready to open for the day, so it was time to get out of the water. The class gathered together one last time. 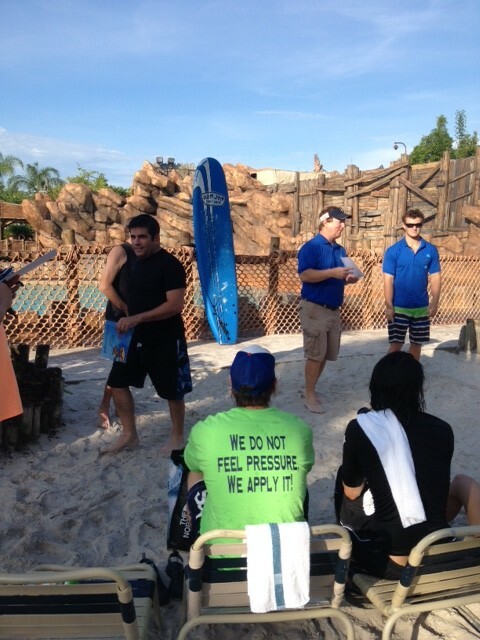 The instructors offered some encouraging words, and then it was time for recognition. 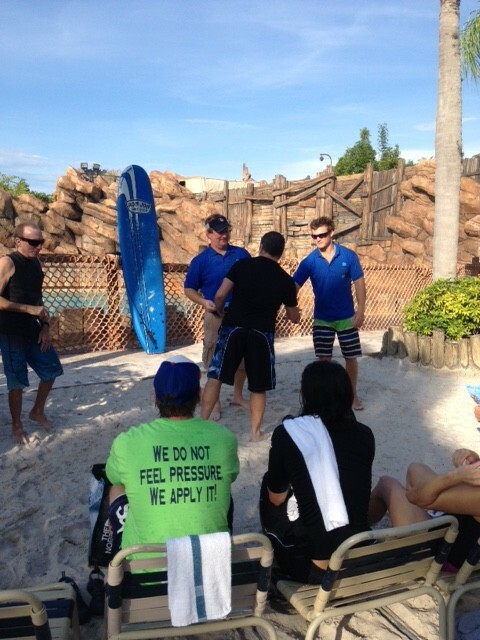 Each surfer was called up to the “front of the class” to receive their own Certificate of Completion. The surfers looked tired, but happy. 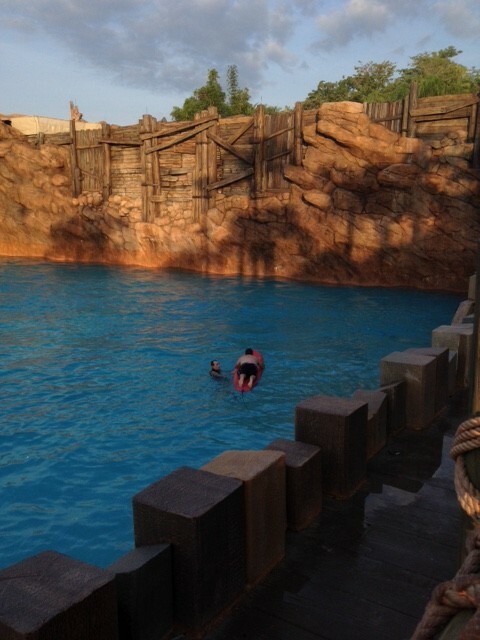 We overheard several people saying they couldn’t wait to do it again. Judging by the smiles, we think it was a successful day for all! Here’s to you, Lou…you’re the best! Be aware that this is an early day! You must show up at 5:30 am to sign waivers and check in. Class size is 12 people max, so call ahead if you plan on booking for your next trip! 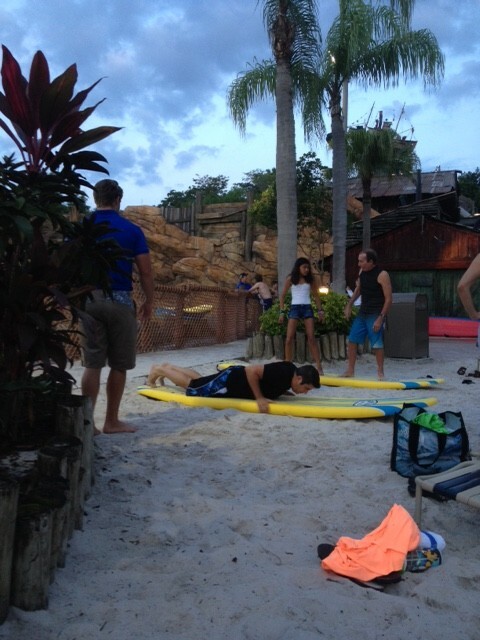 The surf class runs about 2 ½ hrs. 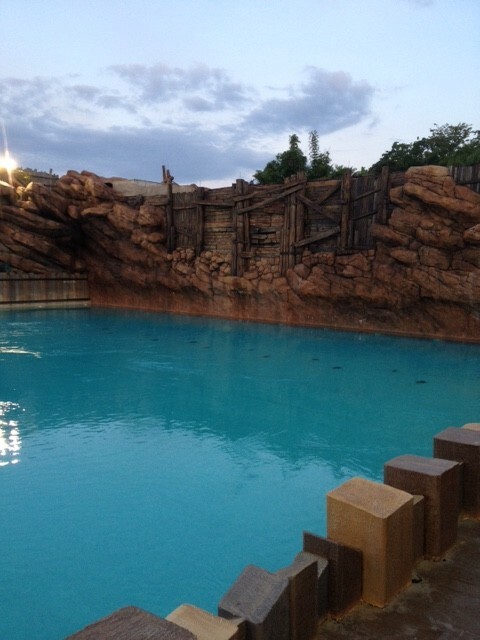 Bring bottles of water & snacks…nothing is open yet! 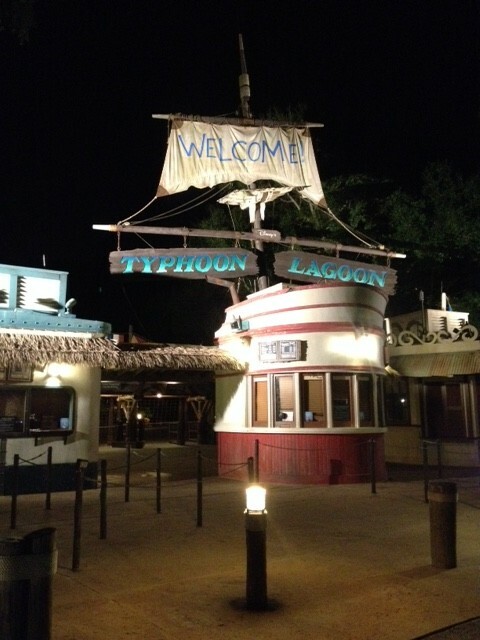 *Thank you to the wonderful team at Disney’s Typhoon Lagoon for an incredible experience! *A very special thank you to our friends from Disney’s Public Relations Team for making this all possible! Maureen Petrone and Pamela Rose are moms, avid Disney fans and elementary school teachers from Long Island, New York. When they are not in the “House of Mouse” with their families, they can be found in their classrooms. They call themselves “TeachEars.” They love the thrill and wonder of the Disney experience. The educational opportunities are endless! Walt Disney was a visionary, who taught us all to think big and dream bigger. It’s a wonderful message for their students. The classroom/Disney connection is a perfect fit! 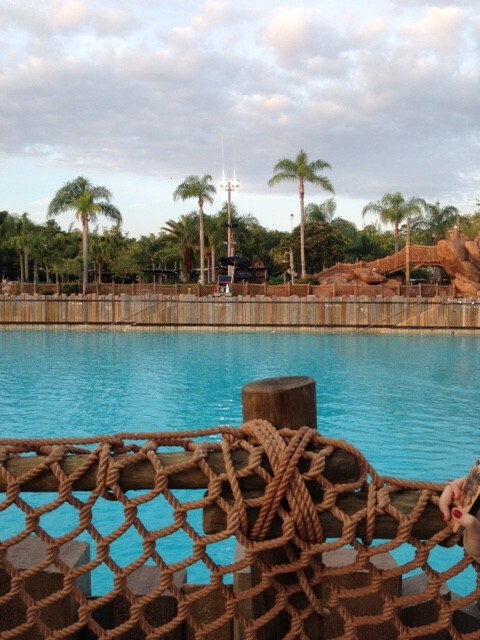 They hope to bring you some interesting blog posts about the Wonderful & Educational World of Disney. Thanks for sharing Lou! That looks like fun! I would love to try it once! What an awesome experience! 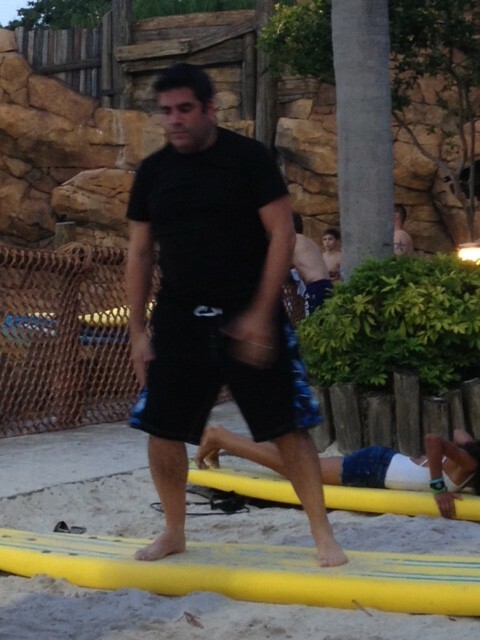 Looks like Lou had a great time and did better then I could possibly do. You should have known the blue board would be the best one! Great job! Way to go Lou!!! We’re proud of you! Great job lou! So proud of you! !